rust repair – Industrial Chassis Inc.
We left off the last post with a completed rolling chassis, HERE and it all happened since then. 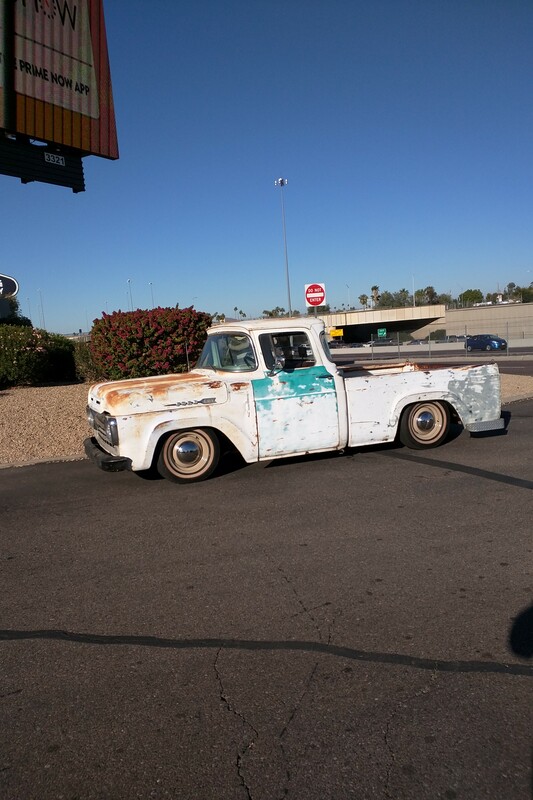 The guys at Metro Auto Auctions asked us to step on the gas and finish this truck for the Barrett Jackson Auction. I have to admit that we did not make the deadline, we missed it by three weeks. Consider this, Dr Marvelus and I took this from a rolling chassis in early July to a completed, painted and upholstered truck at the first of February. Quite a lot of work for the two of us! We did have help though, Doug Stinson of All American Upholstery did the leather work inside the cab and Nessie’s Autocenter did the pink-metal and paint. So here is what happened in the meantime. The cab was blocked into place and the floor repairs were assessed. The previous shop did some pretty poor patchwork and did not provide the new body mount holes. All four corners of the cab were either in need of repair or were done improperly leaving rusty substructure in place. Once positioned and attached to the frame, Dr Marvelus mounted up the doors to see how out of square the body was and did the required pushing and pulling to get the new Dynacorn doors to fit somewhat properly. Both the body and the doors were in pretty poor shape but the good Dr kept at it until things lined up correctly. At that point the guys at Metro wanted a custom firewall with a polished aluminum panel. It was my idea to make that panel open up so you have access to the brake system hidden behind and the electrical panel. While I was dropping off Anthony’s 32 3W at the Lone Star Round Up last year, the guys in the booth next to us had a ’55 Chevy dash in pretty good condition. Since the Metro Guys already had the dash and bezel from Dakota Digital for a stock ’55 Chevy it just made sense that we use the entire dash. To make it fit, I cut four inches from the center of the dash and the good Dr cut off the remainder of ’55 that we didn’t need and added new material to the leading edge of the dash to match up to the ’51 Chevy truck windshield. Cab fabrication under control we updated the engine compartment to showcase the engine a bit better than the stock fenderwells could. We started with a Direct Sheetmetal kit and to be honest, we would have been better starting without. Dr Marvelus had to do quite a bit of modification to get the panels to fit the radiator support and with the firewall pushed back, the back edges of the inner fenders didn’t reach far enough. Things got pretty hurried and I didn’t shoot too many pictures as we went, but most of it was fairly routine work. At one point we made the decision that the previous shop’s work welding up the seam in the middle of the stock hood pretty much ruined it. Instead of cutting out the recessed joint and flanges, they MIG welded the entire seam and started filling the 1/16″ deep channel for the stock trim with weld. This really distorted the hood and was going to require more work than we or the customers really wanted to get involved with. Metro bought a Dynacorn replacement hood, we regret doing so now. It took more work to get it to fit than the stock hood would have been to repair. I do not recommend anyone purchase one of these hoods unless you are very desperate for one. The hood was short and curled under at the front which required Dr Marvelus to cut the structure out and flatten out the nose more than 1 1/2″. The next problem was the location and shape of the hood hinges and bracing. It had to be cut apart and reshaped. And after two solid weeks of work the hood is taller on the driver side and longer on the passenger side forcing us to move the entire front clip over to the left side of the truck to get the hood gap at the cowl to even be close. After 80+ hours of work to get the hood to fit this good. The bed, rear fenders, running boards et-al required countless hours of cutting and shaping to get close, it honestly was all a blur to push the sheet metal work fast enough to get out for paint. The guys at Metro AA wanted to accelerate an already hurried pace, the front clip and body went to paint before we even started the bed work. We proposed some changes along the way but they didn’t want to spend the time so style wise, what the other shop had already started was our job to finish and push to paint. As the last piece of sheet metal left our shop it was Thanksgiving time. With the sheet metal off, the exhaust system and final chassis details got attended to, steering supports, anti-roll bar, threaded bungs for accessories etc. This is when we blew apart the chassis for chrome, polish and powdercoat. Russel’s Custom Polishing did an absolute amazing job and some seriously personal service. I HIGHLY recommend these guys! Kerr West did the chrome on rush job and Desert Powder Coating knocked out the frame, parts and even re-coated the headers. It was nice to get a break and catch up on a few of the other projects that got shelved for this build. But as the parts started trickling back in, we jumped in with both feet on the reassembly. All Stainless Steel brake and fuel lines, body color painted engine, trans and rear axle housing. This chassis looks fantastic. C4 Corvette front end parts all polished up! The day after Christmas, we got the call the cab was painted. Chassis on the trailer and picked up the cab. Then the rush was, wiring was top priority because there was so much of it. Inside the dash there is an Ididit Keyless Ignition (more on that later) Dakota Digital climate control, Dakota Digital automatic headlight and timed dome light module and the Dakota Digital VHX module and a few relays plus a compass and outside temp module, the Haywire Inc E-series fuse panel and a half dozen more relays, line lock, coil, MSD 6al, wiper motor and a Vintage Air Gen II three vent AC/Heat-Defrost unit all snuggled around the brake booster and cylinder. The wiring fun begins! How did you spend the week after Christmas? And here is where the fun started. The quality of the components was less than fantastic. The Keyless Ignition gave us nothing but fits. I recommend everyone not use this. The wire leads were less than generous as advertised and literally fell out of the connectors. The functionality of this unit also leaves a bit to be desired. I see no convenience to using this over a traditional ignition switch. Plus, in an emergency the shut down time seems like an eternity and if for some reason you lose your brake lights through an electrical problem or if you have a brake light switch failure or if you use a hydraulic brake light switch and happen to lose the brake system, you cannot shut the engine off. There is no failsafe. Yep, bad crimps. The wiring just fell out. The hours rolled on and the zip ties copped for it in the hundreds as Dr Marvelus and I restrung the entire underdash. Under dash done, Doug had been taking apart out harnesses going down the toe boards and flattening them out. Just as we were wrapping up the wiring the painted parts for the front sheet metal started showing up and we could get out of the cab and let Doug do his thing. But first we had to install the power windows. This is where things really started to fall off the tracks. The Dynacorn doors are decent, but not exact reproductions. An the New Relics power window regulators did not fit as advertised. Dr Marvelus had to cut away the landing ledge inside the door just to be able to install the regulator, then there was no tail mount to keep it from moving around once bolted in to the stock three holes of the original regulator. When the glass went in, the regulators hit themselves and the windows would not go up or down. Many frustrating hours clicked by before deciding to grind and round off everything on the regulators so that if they did hit, they wouldn’t hang up on each other. That problem solved, the next one popped up. We built the dash extensions onto the original door window moldings. The truck is a ’51 and have a vent window and frameless glass. The doors and windows we got are for an earlier truck with framed glass. The window channels are 1/4″ thicker than the door moldings were designed for. This caused a major problem that required stepping back a few steps. We made a new template for glass without the frame and used the narrower felts to get the door frames to fit properly and this also gave us extra clearance for the mechanisms, HOORAY! All sorts of things were going together, AC and heater lines, inner fenders and such, the radiator and gear went in and I started fabrication of the aluminum shroud and mount for the Lincoln Mark VIII electric fan. The time was running out on us and we were still missing parts to put on. The week before the dead line my good friend Tom brought in the bed wood but we still didn’t have a bed or front fenders. But we had the dash so that went and got wired up. Just a few days before our deadline the bed and front fenders showed up. Doug had the headliner and door panels in and the carpets done. Seat was MIA but it didn’t matter. The deadline came and we had way too much to get done. So we took a solid weekend off for the first time in three or so weeks. The following Monday the push was back on. I had to make headlight mounts as the one we needed were long gone. Tail gate supports, hood supports, stereo system, glove box and fabricated trims to finish off the dash around the steering column. We were still plagued with weird issues like the fan coming on if you had the driver side door closed but the passenger side open. Broken glass from a stray broken drill bit and a fuel sending unit that didn’t work with the gauge system. It is all sorted out now and I have to say, this is one of the best driving cars/trucks to come out of my shop. It’s a blast to drive, handles incredibly well and is very well manner even on rough pavement. Here are the final pictures. Bed, yes it’s that orange out in the sun. Great depth and color, thanks TOM! Been a long and difficult journey to get here but it’s finally ready to leave. SamIam wanted to move on, it served it’s purpose and was ready for the next chapter in life. There were plenty on the HAMB who wanted to see the car preserved for the ages, only problem was it needed so much attention to be a useable car. If it were to be preserved, it would have had limited use. Miles and I share the same philosophy on cars, they are cars first and if they don’t work then make them work. Please don’t think I’m putting down Sam, I’m not. But the car was rough and Miles did his level best to try and make it work for him. But as we all know that no two men have the same vision on practically anything, it applies here. Miles and I sat down and talked about our vision of what to do. The controversy started Miles decided to ditch the cut down 23 T coupe body for a 27 body I had. The frame was shaky and needed some attention other chassis bits too, the rear was broken and needed to be rebuilt, the super cool SamOram intake needed some machine work to get it sealed to the heads and so on. As we took the car apart we laid out a plan to get things sorted out and formed a whole new car using the majority of the components. Here is the photo album, enjoy the build process over the last few years. The old Roach Rod reborn into a traditional 60’s street roadster. The story goes like this, Mr Funk called my sidekick Dr Marvelus on a late Friday night just after picking his “Rat Rod Hudson” from another shop here in town. Mr Funk was pleased as punch to get it on the road after his two year build process and many foldable greenbacks, but was absolutely terrified by what he now owned. The good Dr told him to bring it in Saturday morning. What showed up on my doorstep may just be……. I digress. On with the story. Lets back up a few hours, yes hours. Upon picking up his car, the owner at Puerile Customs told Mr Funk to take it easy, don’t go out on the highway and learn the car because its a bit of a handful. Mr Puerile assured Mr Funk that the car was sound and he “stood by” his work. By Mr Funk’s account this car needed your undivided attention 100%, no taking your eyes off the road even for a second to look at the oil pressure or temp gauges. He was uneasy but had no major complaints as he drove his car home. Enjoying his conveyance it was time to hit the local, ahem, pub. Mr Funk recounted a tale of showing off his new joy to some colleagues and after some good natured ribbing and displays of encouragement, Mr Funk stepped on the gas and the trouble began. The car careened in an uncontrollable manner and started the dreaded “death wobble” with the brakes applied at maximum sphincter gripping pressures, nothing happened. No control, four lanes of traffic were crossed before the car came to rest. Now terrified, Mr Funk made the call to Dr Marvelus. And so, this is what landed at my doorstep. As delivered by another shop here in the Phoenix Metro area. Initial inspection, the drastic negative Ackerman, Model A wheels and steering location warranted a closer inspection. There was quite a lot to take in. Someone had obviously spent some time trying to produce something that would stagger its onlookers. This car is definitely not HAMB material. Certainly not worthy of our notice. A breed that deserves our disdain and upturned noses. However there is a lesson to be learned here, an example needs to be made of those who have wronged Mr Funk and an opportunity for myself and Dr Marvelus to showcase our finely tuned skills and abilities. Let me bore you with the intricate details of this so called “rat rod” shall we? This first set of pictures is from my initial inspection, all I was truly concerned with was the condition of the front suspension and why it had the guidance system similar to that of a Scud Missile. The first thing to draw my eye was the steering linkage, made up from pipe wrenches and connecting rods with a few machined bits thrown in for good measure. The steering box is a Saginaw 525 possibly from a Jeep because it takes 6.5 turns from lock to lock. The box mounted on studs just aft of the radiator were not sleeved. The holes were near edges and the plates were not fully welded. The steering shaft back to the steering wheel consisted of welded couplers, universal joints and a stub shaft from a VW bug mounted in a single bushing hanging from the dash. No substantial support left the steering wheel a bit flaccid. I apologize for letting that tidbit escape my camera’s eye. Non hot rod related parts used as vital components and done very poorly at that. If you would take notice, the welds holding the pipe wrench to the steering system in the above pictures. Notice how over temp and undercut the welds are. I broke that bit off with a two foot prybar and about 30 pounds of force. The next bit of bother was the tie rod. Most of you fine chaps know that mounting the tie rod out ahead of the axle is not always the best solution to your problems. However when building a “rat rod” getting the car as low as possible is your only concern. This means placing the front beam axle ahead of the radiator. This not only allows the lower tank of the radiator to be as low as possible, but also nudges the front axle out for at least another foot of wheelbase. This leaves the problem of what to do with the tie rod. Behind the axle is an issue as it interferes with the radiator and it’s rakish angle so your best bet is to flip the steering arms around front. If Mr Puerile had known about the work done by Mr Rudolph Akerman he could have avoided this folly into a steering system that caused the vehicle to push so severely that turning the wheel to full lock had a turning radius somewhat inside that of the Queen Mary. The steering arms you see are most likely from a 1953-1956 Ford F100. Wait for the more creative uses of more of this donor vehicle. So much horrible in one place. Not truly concerned with the air spring mountings or any of the other gear, Mr Funk and I agreed to a figure and the vehicle was left to me. I pulled the vehicle inside my shop. It took me 20 minutes to achieve this due to the small 8′ door and 90º turn to enter the shop. I shut the doors late Saturday night and left the little Hudson to think about where it had been. On the following Monday when I opened the doors and flicked on the lights the little Hudson greeted me by pops and creaks. It was resting firmly on the ground and the air pressure in its scuba tanks was at naught, but still, the suspension was so bound up that it continued to settle over 24 hours later. The entire air system would not hold pressure for more than 20 minutes. In fact, it leaked so badly that it needed adjustment every 5 minutes or so just to maintain altitude. And on to that. In adjusting the suspension from drivable to flat on the floor was not even remotely smooth. It did take a considerable amount of time to build up enough pressure to overcome the sticktion of the suspension mountings. And it was not easy to replicate the driving position. Dr Marvelus and I donned our handschuhes and went to work. We found many things awry, the connecting rod bell crank system was merely hand tight, without any manner to keep the Grade 5 bolt in place that acted as the pivot. No inner sleeves, no bearings or bushes. We now know just some of what caused all the creaks and moans. And on top of not having a bushing for the bellcrank to pivot, the bolts were finger tight and had no means of retention. During dissasembly we notices several of the “welds” were poorly executed and were already showing cracks. The problems were mounting up and the agreement I made with Mr Funk were starting to fall out of favor with me. But a deal was struck and I needed to stick to it. As the dismemberment went on and I was cooking up a plan on how to save this car for Mr Funk more exciting fabrication work was found. The good Dr and I assume that this car was concepted and built by stacking items against each, on the floor, other until pleasing to the eye then scraps of metal and what ever was lying about were used to make connections between the aforementioned items. Note the missing retention bolt in the brake pedal arm and the unsupported brake lines and residual pressure valve. This is half of a 53-56 F100 axle repurposed as the bellcrank for the rear airbag suspension. No bushings, sloppy fitment and no means to service. Rear suspension from the underside, note instead of cutting the threaded bung off, shortening the tube and re-attaching the bung they decided to split the links in the middle and sleeve them. Dumbfounded. I reviewed what lay before me with the intent on just trying to fix what was here to make the Scud-Hud safe and reliable but was stymied at every turn. I could not find a frame or fitment satisfactory. My options were dwindling and knew I was just wasting time and energy. I decided that everything forward of the cowl was a lost cause. Nothing save for the brakes, spindles, HEIM joints and air springs themselves were about the only items worth salvation. I went through quite a process to create a whole new front section of frame. I was unsastisfied with the look and condition of the 1941 Ford front I-beam axle and decided to trade Mr Funk one of my standard Model A axles. I also wanted to improve the pedigree of the old rat to a more upright citizen of the motoring kind. This meant standing the radiator and shell proper upright and rearranging a few items bringing the car into fine shape rather than the slough it was mimicking. Firing up my digital computing machine and manipulating my figments the new front end started to grow on my screen. New formed frame rails with giant speed holes to help shrink the overall visual size of this car, it is rather large. I also placed a facsimile of the Model A axle and placed new connecting links and “batwings” to hold all the various bits in place as “traditionally” as possible given the circumstances. Rumaging through my pile of cast offs I found a set of Delco Lovejoy shocks from the rear of a 1938 Cadillac that were in fine sporting condition and though they would be a very nice addition to the front of the Scud-Hud. As the car had no shocks front or back and the nature of the “suicide” mounted front mounted axle tends to not be friendly to airplane shocks. The long lever shocks could be mounted on the flanks of the frame rails with their spindly arms reaching forward to the axle. My intent was to clean the lines of the new front frame section and draw your eyes away from the tidbits that were visually unappealing. The placement of the Cadillac engine afforded me just a bit of space behind the engine mounts to create a location for mounting the somewhat repulsive air springs. To connect the axle to the air springs I created a shaft and lever system mounted on bearings. This gave the appearance of torsion bars, a much more accepted look to the discerning Trad-Rodder. Just installing simple levers did not satisfy my visual intent and did not articulate the air spring properly. I tipped the air springs outboard by 30º and created an unequal length and nonparallel linkage system that pushes the top of the air spring reasonably close to the the 30º line the air springs are mounted on and this also gave me the opportunity to use longer bellcranks for the leverage ratio I wanted. As an added bonus, I could install a polyurethane bumpstop under the upper control link and make it adjustable if needed to prevent the newly built vehicle from actually touching the pavement. The clevises used in the four link bars are common rod ends available from my favorite hardware dispensary, McMaster-Carr. The ends are attached to the fabricated “batwings” using large shoulder bolts and PEEK plastic bushings That allow rotation in one plane. Using a HEIM on this end would not work properly as the weight of the car is going to be hanging from the batwing and a few inches aft of the axle. There will be forces to pull the batwings inboard, this arrangement of connection will hamper this action. More tabs, slots and crossmember bits in place. While I was designing the save for the front half of Mr Funk’s Scud-Hud, he had a conversation with Dr Marvelus about repairing the less than satisfactory body panels and possibly taking care of a few more items on the car. I was waiting for materials and supplies to show up so in order to keep things moving along, the good Dr Marvelus sheared up some sheet steel and went banging away. As the materials showed up, I processed the solid model drawings I had made into a language understood by my plasma machine. Cut the parts and started to assemble the individual components to make up the front clip. I spend some time machining tubes to accept the bearings of the lift shafts and securely welding them into my motor mount/air spring structure and radiator core support. And Dr Marvelus attacked the rear with a new apron to cover the Scud-Hud’s neither regions. More parts added into the mix and the front half of the frame is taking shape. The four bars are fabricated using 1.25″ X .125 DOM steel tube for the uppers. The 1″ clevis at the front and the salvaged 3/4″ HEIM at the rear. The lowers are 1″ X .125 DOM steel tube with a 3/4″ clevis at the front and a 5/8″ HEIM at the rear. The linkages connecting links from the shaft bellcrank and guide link have bronze bushings and sleeves to allow free but controlled movement. The front of the lift shafts are connected to the batwings using standard 1.75″ spring shackles. The day came and the Scud-Hud was to become a bit more Sir and a bit less Rat. Dr Marvelus and I scuttled the Hud from the two post lift to the fabrication table and continued to centerline and level the Hud out. Clamping it to the table we realized how out of square the frame was, twisted and deformed. The engine and trans were pulled from the solid mounts and the cutting began. The weld slime was removed and the remaining frame chunks were trimmed to a reasonable size and condition for me to attach my new front frame section to. Mr Funk asked me to inspect every element of the car to ascertain the proper function and serviceability. While assembling the front suspension to set up the new steering arms, I needed to remove the brake rotors from the spindles. Upon pulling the dust caps I found blacked grease. I am familiar with the type of grease, it was Lucas Red Tacky and was gritty and burned. Not only that I noticed there was not a tang-washer in sight! This was a disc brake kit ordered directly from Speedway Motors and I would be a bit dismayed that the kit did not come with one. Regardless of whether it was supplied or not, there was a machined and zinc plated spacer between the outer bearing and the spindle nut. I inspected the bearings, there was a liberal amount of grease applied to the spindle stud but superficial amounts were packed into the big end of the rollers. It also appeared as if the protective coatings the bearings were shipped with was not removed and this contaminated the bearing grease. Moving on from that, I fitted the king pins to the new Model A axle and modified the Speedway caliper brackets to work with the CE bolt on steering arms and cut and threaded a proper tie rod. Proper steering arms, tie rod and fitted king pins. Caliper brackets modified to work with proper steering arms. It was about this time when I realized what type of vehicle these RadRodsters are trying to emulate, I think they are enamored with the Fuel Coupe but just miss the mark by a bit. We’re going to help the proportions of this car quite a bit. It was about this point where Mr Funk reached his ultimate frustration with the Scud-Hud. He wanted Dr Marvelus and I to remove the silly ammo box wiring control system, seats and expanded metal drive shaft tunnel to get the floor out. At the same time to investigate why the rear axle was offset to right by over an inch. What we found made us quicken our pace at deconstruction. There was literally everything from a dollars worth of Nickles to exhaust U-bends, Rebar, All Thread and multiple layers of scrap metal that made up the floor. All manner of square tubing and plate was used to weld the rotten body to the frame. Two flex plates copped it for the seat mounts and they were cut in half so haphazardly that who I assume was Mr Puerile that had done this work, filled over a 1/2″ gap with MIG weld to attache the half flex plated to the 16 gauge sheet metal floor. Flex plate seat mounts and a gap weld of epic proportions! Time to gut this Hudson like a fish. You get a fantastic shot of the rear suspension here. Now we were getting down to the meat of the matter. Just how so much of this car got off track and why so much was out of square. The frame rails were tapered, narrower at the front than the back under the body. However, the builder squared the crossmember tubes to the right side frame rail making the cross beams not square to the centerline of the car. This mistake was further compounded in the rear kick up that supported the entire triangulated four link system. While the brackets were close to correct on the axle, the frame they were attached to were not. My judgement was to cut the rear kick up off and the last rear cross beam and try to rebuild the frame from there back. After deconstruction it was clear that there was no saving what was left without many hours of laborious work and for little gain. It all had to go. Out came the Air-Arc to remove my clip from what was left of the sorry frame. Back to the computer for me. I had to construct a simple and cost effective frame that would actually work well with what I had already created but didn’t rupture Mr Funk’s wallet. I also needed to reuse as much of what already existed and keep it all under the envelope of the body. I regret my decision (you will see later) but the end result works quite well and Dr Marvelus and I can finally cut this project short and get back to repairing. I chose a triangulated rear four link system with a air spring mount that keeps the end caps of the bellows parallel to each other. What would you trust, this or what was? While doing my set up for the upper bars of the four link system I found the last bit of rubbish I had to deal with. While the lower fourbar/coilover brackets were at least centered on the housing, they were not clocked properly. The right side bracket was at least 15º forward of the left side. This pushed the rear axle back over 1/2″ on the right. They had to come off. Note the square to the left of the picture is on the table and the bracket is rotated forward so much that nothing will align properly. The lower bars of the rear four link are a bit complex, but considering what I am going to ask of them they will need to be heavy duty. The sides consist of 10 gauge Cold Rolled steel plate, machined bushings and a length of 1.25″ CR Bar threaded with 3/4″ 16 on the end to accept the Heavy duty HEIM end. Then the rest of the assembly came together rather quickly. Upper bar and bellows mounts, and damper strut mountings. I reversed a Corvette steering gear I had lying about and attached it to a mount sprouting out the back of the left front frame horn and then fabricated a new steering arm to finish up the front. A set of engine mounts and transmission pad to tie up all the loose ends before disassemblely and final weld out of the frame. Off the table and onto the floor for another mock up. This time with the new wheels and tires, no adapters and a whole new attitude. These last few shots are without the bumpstops in place, so yes, the frame can touch the ground. With the stops in place it cannot. There is still quite a bit for us to do yet, but for now it’s off the table and is ready for true progress for a total redemption. While it may not be your style of car, it will be a sound and safe driving car with a flair. Dr Marvelus and I will be repairing more of the bodywork, installing a true floor that seals out nature. As well as adding a few styling cues that will help prevent the Scud-Hud from being terribly dated and keeping Mr Funk happy for miles to come. The project took a turn, Mr Funk didn’t want to spend the greenbacks to properly repair the Hudson body. It was discussed that if he could find a better body with a bit more value it would be in his best interest to do so. He found a very rough 1931 Model A coupe body with a horribly botched chop and quarter repair. This is the body that the car left with. I will do updates in a while. I am just bringing this up because someone brought it up on the HAMB today. This is #3 of three ever built full custom Helve Hammers. This started almost two years ago with my desire to build a helve hammer for myself and the need for a power hammer of some sort to speed up work progress on a few projects around the shop. I wasn’t pressed for time so #1 took almost a year for me to complete and start using. Mike Tatum and Jessy Whitener persuaded me to build them each a copy, the persuasion was a good trade for all of us. So near the end of last year, I started the build process on two more machines, Jessy owns #2 and a generous trade was to be made at the completion of #3 to Mike. Since Mikes passing, the trade is off and his survivors pounced on the piece I really wanted and sold it off already. That leaves me with a machine that I would like to keep. I have over 150 hours in crafting this machine, this is a labor of love for my craft. However, times as they are and I need funding to push other projects forward in the shop I am offering this machine up for sale. 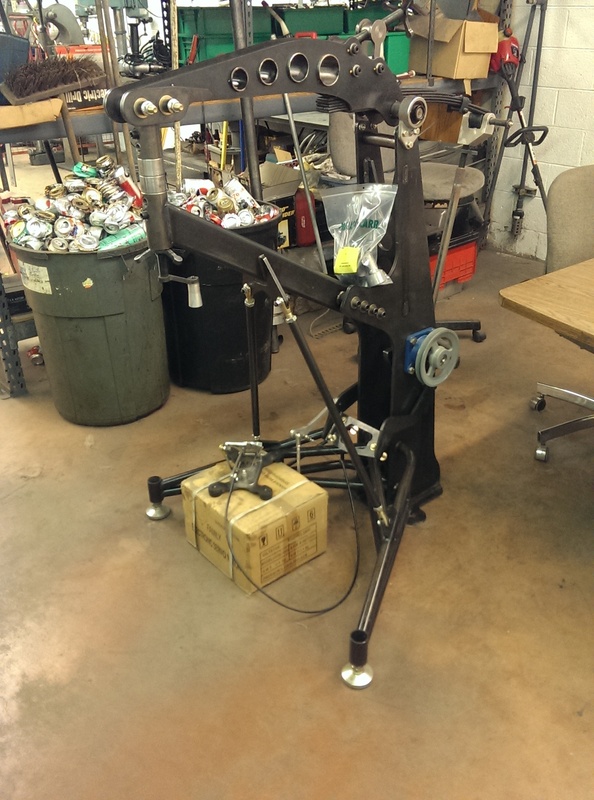 Machine will include a completed hammer assembly, 3/4 horse DC Servo motor with “dragster style” foot pedal. Several hammer head sets including a die holder for making beads and profiles and instruction on how to adjust the machine to perform heavy blows for rapid shaping or for fast firm blows for planishing action. $6500.00 and local pickup only.